Life means life, so when you read Scarred for Life volume one: the 1970s – Growing up in the dark side of the decade, a celebration of everything that scared you rigid in the 70s, from public information films (PFI) to TV programmes, that’s exactly what you get…scarred. Over the years those scars may have become feint distant memories but they come screaming back to haunt you as you eagerly explore its 740 pages. Exhaustive is putting it mildly as chapters wise it covers everything from the afore-mentioned TV to PIF to board games and ice-lollies to comics, all in glorious detail with numerous images to help return the things that you spent the last 30-40 years trying to forget. It really is a delicious dystopian sweetshop of the 1970s, with it hard to know what section to consume next. Answer, all of them. Engrossing, informative and entertaining beyond belief it successfully wrestles the 70s away from those programmes that just take the piss with inserts of ‘comedians’ doing vox pops and showing how the 70s was oh so un pc. Just scrolling through the content is enough to whet your appetite and demonstrates their true love for the cultural touch points this decade produced, whether it be TV show, advert or toy. It really is all here. Even down to the Fleetway Annual homage on the front cover, what’s not to love. I’ve not felt this excitement and giddiness about devouring the contents page(s) – all five, count ‘em – since reading Kim Newman’s Nightmare Movies when it was first released in 1987. The book sets the scene perfectly, it may as well be me laid on the carpet, head propped in my hands. The Amityville Horror, Bigfoot, The Bermuda Triangle, Watership Down, The Pan Book of Horror and the Usborne Book of the Unexplained – that IS my childhood and it is all gloriously revisited. You are hooked from the off. Obviously if you were born in that decade, felt its cultural ripples or grew up in the 70s you’ll get the most out of with instant recollections of I remember that, I had that and remembering moments from childhood that were long forgotten but smash back into your conscience as if they never left. That intro is so evocative at transporting you back to that time in your house, it’s almost like time travel itself, regressing like Christopher Reeve in Somewhere in Time as the words wash over you or seeing the decades and décor roll back like Rod Taylor in The Time Machine watch the constantly changing shop window. Each entry even provides suggested viewing and suggested further reading; this is very clearly written by fans for fans. I’ve had to keep a note book alongside me as a read it so that I can just keep track of my future viewings and reads. My Amazon account is going to take something of a bashing. We also get regular appearances by ‘the art of the title sequence’ breaking down some of TVs greatest every opening credits. These are the shows we want on our Netflix, Amazon Prime, ITV Player and BBC iPlayer, or even BFI player. Essential, it’s damn near perfection. The ‘I did not know that’ facts come thick and fast as well, such as the creator of Shadows, a supernatural anthology series for children was from the same person that created Rainbow. The chapters are like longer versions of features from TV Zone, SFX or the – all too short lived – Cult TV magazines, a spin off from SFX. It’s refreshing long form writing that never out stays it’s welcome. It’s absorbing and makes you want to consume it in one, or certainly as few sittings as possible, but is also designed as such that you can easily dip in out of chapters or subjects that interest you. I guess the only shame is a lack of an index, but minor quibbles aside the contents pages are in plenty of detail in that regard. Brimming with programmes I’d seen (Grange Hill, Blake’s 7, Worzel Gummidge), those I knew of and had read about (The Tomorrow People, Doomwatch, The Stone Tapes) and those I’d not (Beasts and 1990) it’s an interesting and a great package bursting with familiar, heard of and new delights aplenty. You can’t help but read it (crossed legged on the floor of course) and smile. As well as all the television moments, the highlights for me were evoking vivid memories of The Doctor Who Exhibition in Blackpool; I never even met anyone else who went! The still-scare-the- bejusus-out-of-you public information films, particularly the Lonely Water, which, complete with full horror tropes, plays out like a 70s version of It Follows, and the escalators one with the red wellies ripped to shreds. Shudder! It gives you one of those joyous crick necks where you’ve just been staring down for such a long period of time, like when you just read through The Guinness Book of Records. You could easily lose yourself in it pages for days on end. A celebration of the odd, strange and macabre that hit our screens, shops, book shelves and magazine racks. And even if you didn’t it effortlessly captures that period’s output and shows us that it wasn’t just as is oft portrayed, as just about wearing flares and disco dancing. Today is often referred to as a golden period of television and writing for television, something which is said to only recently herald from the States, but this volume clearly shows that writing and content was king not just in dramatic output but children’s dramatic output. Windy Miller, we aren’t in Camberwick Green anymore. And everything else, from 2000AD to Roy of the Rovers tackling hooligans, is just as rich. Doctor Who and hiding behind the sofa is just the tip of the ice-berg. An assault on the senses, it doesn’t just capture my childhood, it is it. Observations are just so spot-on, it’s a landmark dissection of this period and all the great and frankly demented things it had to offer. If volume two, which focuses on the 80s – my mouth is watering already – is of the same standard, length an fun to read – and with the likes of Blake’s 7’s ending, Adric dying in Doctor Who, The Adventure Game and Mr Noseybonk to name but four things I’m expecting to make an appearance – these two encyclopaedic volumes could well be The Godfather Parts 1 and 2 of books about popular culture. If you were a child of the seventies or grew up in that decade it is an offer you can’t refuse. A definite a must buy. Available soon from Lulu.com for £16.99, that’s great value at just over £1.69 a year! On January 13th 1976, the Lutz family moved out of their dream home, 112 Ocean Avenue, after only 28 days. That dream became a nightmare best depicted in The Amityville Horror (1979). I’ll always have a soft spot for the film as it was the first horror film that I ever bought on VHS (Woolies, Mansfield, 1987 if you are interested), a striking cover from The Video Collection showing Margot Kidder facing down a ruddy great axe. A publicity shot as that scene isn’t shown from that angle in the film. The film, based on the best-selling novel by Jay Anson, was a massive success upon its release, very much taking its horror cues from both The Omen and The Exorcist, and like the latter had the much-loved horror staple of being based on a true story. The truth and the half-truths have long been conjecture but it is certainly undeniable that the murders at Amityville and the subsequent stay by the Lutz’s has become the stuff of horror lore, from possession to houses being built on Indian burial grounds and blood running down walls. And that is still what makes it a massively accessible story, its a classic haunted house movie, hokey in places but that is part of the fun of it. Oft-imitated? Sure, and you’ve only got to look to the return to haunted house films of late, from Sinister to When The Lights Went Out and The Conjuring to see their enduring appeal. All of which are old school in their scares, like Amityville, the latter The Conjuring – also based on true events – even features two paranormal psychics who at the close of the film are heading to their next case, none other than at the house in Amityville. The house, with those unmistakable evil eyes actually features in the opening of The Conjuring 2. And talking of the house, that’s where we start with the opening titles over a silhouette of the building featuring a haunting Lalo Schifrin score – allegedly a rejected The Exorcist score but isn’t, however it was used to great effect on the trailer for Pet Sematary and suitably sets the tone. The film and book would have us believe that the house is evil, it is certainly the star of the film (if not the original house or location) and its evil eye windows can be seen staring at us throughout the titles and the poster – interestingly enough the windows or the original house were changed to normal rectangular ones to stop people finding it. Cut to a dark and stormy night, what else. So far so typical house of horror, but amid the lightning outside we see lightning inside, created by gunfire in each of the rooms. Although the family, clearly including children, aren’t named they are the very real DeFeo family, by eldest son, Ronald DeFeo, shot in their beds as they slept on November 13th 1974. The Lutz’s (played by James Brolin and Margot Kidder) and their children look round the house a year later, shown round by the estate agent who just so happens to be the save the clocktower woman from Back To The Future, funnily enough Strickland from BTTF also plays a coroner in the previous scene. As the couple are shown round the house it overlaps with scenes of the murders taking place in those rooms, which is really effective. They buy the house for $80,000 and so the film unfolds, slowly burning and building to its climax of exploding windows and walls and stairs that drip blood. It certainly slowly turns the screws in the minds of the characters and the audience and builds pressure cooker-style, exploding like the front door off the house. And whilst everything doesn’t work or make sense it has more than enough images and moments to linger and stay lingering to this day. Even if it almost seems as if his character belongs more in The Omen at times. Added to that we have upside crucifixes, invisible friend Jodie, glowing pig eyes, self-rocking chair, dubious cellars and the we forgot the dog moment. The debate over whether it is a hoax or true horror rumbles on, but the truth is that this is still a memorable and creepy film. Classic? For me it is, although that may be more to do with when I first saw it. 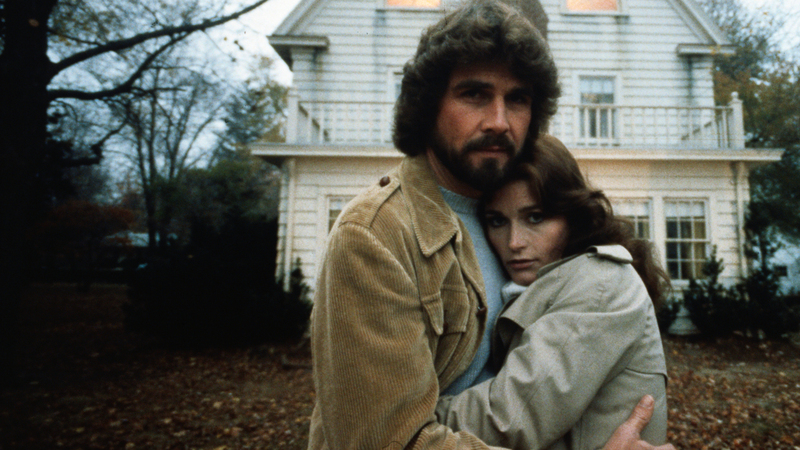 Even if you have never seen The Amityville Horror you will have certainly seen a horror film that has taken influence from it. If you have never seen it, or not seen it in years make sure you make the rightmove and give it a viewing. Just make sure it’s the original and not the insipid 2005 remake. It’s 40 years to the day, January 13th 1976, since the Lutz family moved out of their dream home, 112 Ocean Avenue, after only 28 days. That dream became a nightmare best depicted in The Amityville Horror (1979). I’ll always have a soft spot for the film as it was the first horror film that I ever bought on VHS (Woolies, Mansfield, 1987 if you are interested), a striking cover from The Video Collection showing Margot Kidder facing down a ruddy great axe. The truth and the half-truths have long been conjecture but it is certainly undeniable that the murders at Amityville and the subsequent stay by the Lutz’s has become the stuff of horror lore, from possession to houses being built on Indian burial grounds and blood running down walls. And that is still what makes it a massively accessible story, its a classic haunted house movie, hokey in places but that is part of the. Oft-imitated? Sure, and you’ve only got to look to the return to haunted house films of late, from Sinister to When The Lights Went Out and The Conjuring to see their enduring appeal. All of which are old school in their scares, like Amityville, the latter Conjuring – also based on true events – even features two paranormal psychics who at the close of the film are heading to their next case, none other than at the house in Amityville. And talking of the house, that’s where we start with the opening titles over a silhouette of the building featuring a haunting Lalo Schifrin score – allegedly a rejected The Exorcist score but isn’t, however it was used to great effect on the trailer for Pet Semetary. The film and book would have us believe that the house is evil, it is certainly the star of the film (if not the original house or location) and its evil eye windows can be seen staring at us throughout titles – interestingly enough the windows or the original house were changed to normal rectangular ones to stop people finding it. Cut to a dark and stormy night, what else.So far so typical house of horror, but amid the lightning outside we see lightning inside, created by gunfire in each of the rooms. Although the family, clearly including children, aren’t named they are the very real DeFeo family by eldest son, Ronald, shot in their beds as they slept on November 13th 1974. As the couple are shown round the house it overlaps with scenes of the murders taking place in those rooms, which is really effective. They buy the house for $80,000 and so the film unfolds, slowly burning and building to its climax of exploding windows and walls and stairs that drip blood. It certainly slowly turns the screws in the minds of the characters and the audience and slowly builds pressure cooker-style, exploding like the front door off the house. And whilst everything doesn’t work or make sense it has more than enough images and moments to linger and stay lingering to this day. You believe Kidder and Brolin as a couple and slowly follow their decent, Rod Steiger also has a memorable turn as Father Delaney, he perhaps has one of the most memorable scenes in the film blessing a room in the house only to interrupted by flies in winter (the films answer to The Omen’s er Doberman) and a hissing malevolent voice telling him to ‘get out!’Even if it almost seems as if his character belongs more in The Omen at times. Added to that we have upside crucifixes, invisible friend Jody, glowing pig eyes, self-rocking chair, dubious cellars and the we forgot the dog moment. Classic, not quite, much-loved and much-copied though. 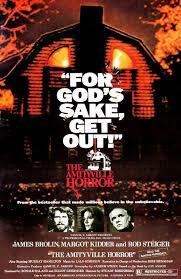 Even if you have never seen The Amityville Horror you will have certainly seen a horror film that has taken influence from it. If you have never seen it, or not seen it in years make sure you make the right move and give it a viewing. If Rendelsham Forest is the UK’s answer to Roswell then The Enfield Poltergeist is surely the UK’s answer to The Amityville Horror or The Exorcist? In the 1970s, the decade that this drama is set, a pantheon of memorable horror films were produced, such as the aforementioned The Exorcist, The Amityville Horror, as well as Don’t Look Now and The Omen, the latter which was largely filmed in the UK. It’s not a decade outside of those that were filmed within it that really lends itself to horror; you’ve only got to look at the fashion and décor for one for horror of a different kind. But the first part of this effective three-part chiller intrigues and grips from the outset, opening with a girl resting on a grave, which soon banishes thoughts of it being Back In Time For Dinner with ghosts and is more East Is Exorcist. Perhaps as a nod to all things that go bump in the night we see a TV clip of Michael Crawford on roller-skates in Some Mothers Do ‘Ave ‘Em, which seems a suitable question to put at the feet of the suffering mother re the daughters in this and of course Crawford is perhaps best known to us now as The Phantom. More recent horror fare, such as The Conjuring, have been set in the 1970s, in fact the sequel is set to be based on this very case, whilst 2012 saw the cinematic release of When The Lights Went Out, which was also set in 1970s suburbia in the UK, where lights going off could be just as much a blackout as a sign of having something more paranormal – something which is very well addressed in Enfield. 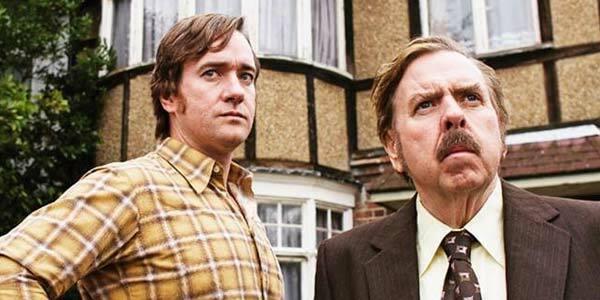 Hangdog Timothy Spall does a fine job as Maurice Grosse, the paranormal investigator sent to check the story out, who is later joined by Matthew Macfadyen, ironically of Spooks fame. It’s that powercut scene that works so well to show us Spall as the believer and Fox Mulder of the piece, he has even recently lost a daughter in the past year which has given him that drive, with Mulder it was of course his sister. Grosse also has angina, which probably means ghost hunting probably isn’t his ideal vocation. Macfadyen is our Dana Scully, both aptly representing the viewers who can’t quite make their minds up as to what is happening or if the girls aren’t making the whole thing up. The momentum and dark foreboding build from the off, complete with misdirection aplenty from the likes of dripping taps, but it isn’t long before we have furniture moved and a dead bird, both ticks in the box for the original Poltergeist as well so it happens. But that is part of the fun, ticking off the conventions and seeing just where it is all going and the jumps and jolts are effective as the tension is truly ramped up. It’s not long before we get sneaking glimpses of shadowy figures, where one can’t help to think of ‘Pipes’ from Ghostwatch, itself which was heavily influenced by this very case. Kerplunk will never seem the same again either after one sequence, nor will viewmaster. And for me that has been part of the success of the likes of Insidious and The Conjuring, that they have taken otherwise normal, unthreatening objects and make us see them in a different light. And if by the time of the teapot you aren’t believing in things that go bump in this North London night then, like Matthew Macfadyen, by the time you have been thrown against the ceiling, you will do. After all his character wrote the book this adaptation is based on. It will leave you wanting for more, which was perfect as Sky Living announced that you could download the next two parts, which is exactly what we did and watched the three parts back to back. I’ll be writing about those as well, but not until after they have actually aired. Looking at Twitter it seemed to have the same desired effect in others that tuned in, scared to go to the loo, had to watch an episode of Friends to calm down or devoured the next two instalments. As hinted, it may add nothing new to the genre but it is an effective chiller with a higher than average jump count that shows the likes of American Horror Story: Freak Show that chilling trumps gore in the scare department. And in that it continues a fine tradition of haunted house stories like Robert Wise’s The Haunting that never lose their ability to chill. There may have been numerous books and documentaries on the subject of The Enfield Poltergeist but this first part still kept me gripped, engaged and provided new insights I was not aware of.